This is a name which can be both locational and nickname job descriptive, or even just a nickname. It derives either from the town of Ahlen in Westphalia, Germany, or from "Ahl" meaning "an" eel, and a nickname for an eel fisherman, plus "kin", shortened to "in", to mean "son of Ahl". As a pure nickname it described "a slippery character", but clearly this was not regarded as derogatory, or it would not have survived as a surname. 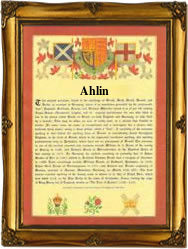 The spellings of the name are recorded both as Ahlen and Ahlin, and early recordings include Barbara Ahlin who married one Christian Hoest at Bayern on October 16th 1759, and Conradus Ahlen christened at Ahlen Westphalia, on May 26th 1776. The first recorded spelling of the family name is shown to be that of Sybillia Ahlen, which was dated November 21st 1662, married Robert Ross(!) at Waltrop Westphalia, during the reign of Emporer Leopold 1 of the Holy Roman Empire, 1658 - 1705. Surnames became necessary when governments introduced personal taxation. In England this was known as Poll Tax. Throughout the centuries, surnames in every country have continued to "develop" often leading to astonishing variants of the original spelling.